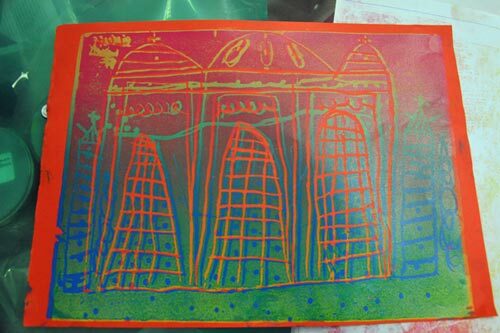 Today at ARTWORKS: Gainsborough’s House Print Workshop! We are delighted to welcome back Gainsborough’s House Print Workshop to ARTWORKS in 2015. Gainsborough’s House Print Workshop is a supporter of ARTWORKS. Today, Sunday 20th September 2015, Sue Molineux, head technician at Gainsborough’s House Print Workshop, will be at the exhibition with a portfolio of prints to share and discuss printmaking techniques, together with information on the courses and facilities at Gainsborough’s house. Sunday 20th September 2015: Gainsborough’s House Print Workshop Printmaking Day at Artworks 2015. Visit at any time between 10am and 5pm, when the exhibition is open to the public. This entry was posted in artworks news and tagged gainsboroughs house, printmakers, printmaking, workshops on September 20, 2015 by admin. This entry was posted in artworks news and tagged curwen print studio, printmaking, workshops on September 14, 2015 by admin. Artworks are delighted to welcome Gainsborough’s House Print Workshop to the Artworks exhibition in 2015 as one of Artworks Supporters. The Print Workshop is a friendly studio established in 1978. Several Artworks artists are also active members of the Workshop. On Sunday 20th September 2015, Sue Molineux, Workshop Technician at Gainsborough’s House Print Workshop, will be at the Artworks exhibition with an exciting display of fine art prints to discuss printmaking techniques. There will also be information available on the courses, workshops and facilities on offer at Gainsborough’s house. Gainsborough’s House Print Workshop is run, along with a thriving museum, by Gainsborough’s House Society, an independent charity with educational aims. Recognised as one of the best facilities of its kind in the country, it enjoys a unique and inspiring setting, opening onto the charming garden at Gainsborough’s House, birthplace of the painter Thomas Gainsborough (1727-1788). Membership of the Workshop is open to all whether newcomers to printmaking or established artists. Help and advice is readily available and Sue Molineux will arrange an informal induction session for new members. A range of courses are available throughout the year covering all aspects of printmaking and are run by tutors who are well known and respected in their fields. This entry was posted in artworks news and tagged gainsboroughs house, printmakers, printmaking, workshops on September 14, 2015 by admin. Artworks are delighted to welcome Gainsborough’s House Print Workshop to the Artworks exhibition this year as one of Artworks Supporters. The Print Workshop is a friendly studio established by printmakers in 1978, and several Artworks members are also active members of the Workshop. On Sunday 7th September 2014, Sue Molineux, Workshop Technician, entertained visitors to the Artworks exhibition with a fascinating display of prints, and explained to visitors how the prints were created. Gainsborough’s House Print Workshop is run, along with a thriving museum, by Gainsborough’s House Society, an independent charity with educational aims. Recognised as one of the best facilities of its kind in the country, it enjoys a unique setting, opening onto the charming garden at Gainsborough’s House, birthplace of Thomas Gainsborough (1727-1788). This entry was posted in artworks news and tagged demonstrations, gainsboroughs house, printmakers, printmaking, workshops on September 17, 2014 by admin. Each year Artworks offers the opportunity for local schools to apply for one of four fully-funded one-day artist workshops, with the schools selecting an artist of their choice from the Artworks exhibition. The four workshops are then planned, organised and run by the selected artists. Schools are encouraged to visit the annual Artworks exhibition in September, and this is often the time when teachers (or the children!) decide on which artist they would like to work with later in the school year. This year I was invited to Great Whelnetham primary school to run a printmaking workshop with eight and nine year old children. Realising I would need considerable time to turn an organized multi purpose classroom into a printmaking studio, it was agreed that I should run the workshop in two sessions; an afternoon workshop followed up by a workshop the very next morning, giving me time to set up and clear up in the two lunch breaks. I planned several ambitious techniques for the children to explore. To my delight they had just begun a classroom project on India, a country I have a deep involvement with, so I was able to provide lots of images and material to work from. The children embraced the experience with focus, joy and enthusiasm and produced some vibrant and thoughtful pieces of art. The results of the two half day workshops will be on exhibition in the schools section of the next Artworks exhibition in September 2012. 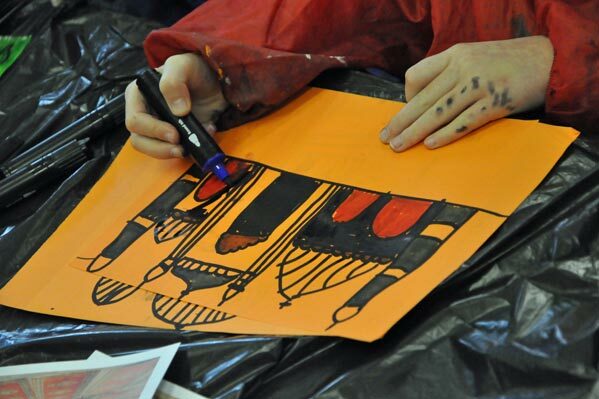 More information about planning school visits and applications for artist workshops is available on the Artworks Schools page. 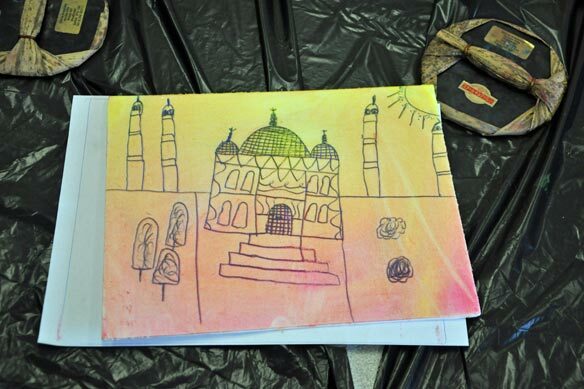 While some school groups simply enjoy looking at the exhibition, other groups come to sketch, paint and draw. There is always someone from Artworks on hand to offer more information on the art, encouraging the children to study, enjoy and absorb all the art in the exhibition. N.b. To avoid possible clashes with other school visits please contact our Schools Coordinator who will assist you in planning your visit to the Artworks exhibition. The Artworks exhibition this year runs from the 8th to 30th September 2012 at Blackthorpe Barn, open daily 10am to 5pm. This entry was posted in artworks news and tagged artists, printmaker, printmaking, schools, suffolk, valerie armstrong, workshops on April 21, 2012 by admin.